Another day, another overwhelming number of pleas for help in our inbox. There are a few people whose emails I always open and read, because they are very good at assessing dogs. 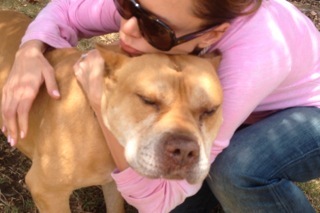 If they say this dog is gold, I know we’ve got to do whatever we can to help them get out of the shelter alive. I have little time to save this 8 year old gentle giant’s life—the shelter vet emailed me and said how gentle and loving, goofy and sweet this boy was—-but she asked me if I thought it was possible to find a good place for him as they cannot keep him long they are so crowded. I met him today and loved him. He is a loving gentle boy who seemed to be good with every dog he met—another dog kissed him on his nose through the bars. He was patient and non reactive to the little and big dogs he met, even those barking wildly at him. His rear legs are a little weak due to age and I roughly estimate that he only might have a year or two left in him. How I wish that we could give that to him in a loving environment, and so his last moments are filled with memories of being loved and not alone in a shelter. But he does NOT need hospice—he walks fine and will be happy for quite some time. Is there a miracle out there for this gentle, noble giant? We don’t have any open foster homes at the moment, but we really want to save this boy. Is there anyone out there who can help us help him? Please keep in mind that Elderbulls are slower to place than younger dogs, so this could be a long-term foster. Puggles & Pitties will cover all vet expenses until he is adopted. We also provide a crate and a starter 30-lb bag of food (if needed). If you can open your heart and your home to this sweet boy, please contact us right away at pugglesnpitties@gmail.com.